When sewing with knits, one of my favorite ways of hemming is using a double needle, or sometimes referred to as a twin needle. With one row of stitching, you’ll achieve two perfectly stitched lines. Or use the closely spaced double needles for heirloom sewing or the wide widths for embellishment. Double needles fit any machine where the needle is threaded front to back not side to side. Common double needles sizes include: 1.6, 2.0, 3.0, 4.0, and 6.0. The sizing refers to the distance in millimeters between the needles. Size 6.0 is too wide for some machines. If the widest zigzag stitch is 4.0 on your machine, do not use a 6.0. The opening in the throat plate is not wide enough for this extra wide double needle. The bobbin thread catches both top threads, resulting in a zigzag look on the fabric underside. 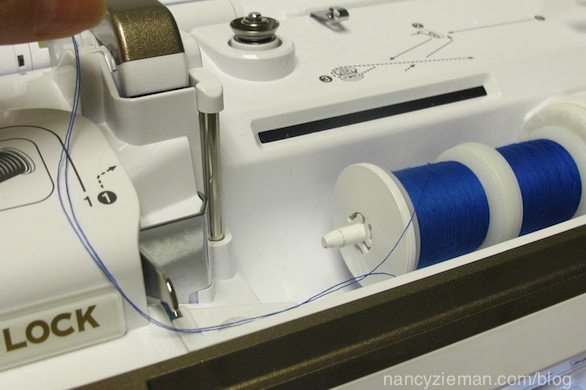 Use two spools of thread on the top of the machine, position them so the threads unwind in opposite directions. This prevents the threads from tangling. If your machine does not have two spool pins, wind an extra bobbin and stack the bobbin with the spool on the spool pin. Again, stack them so the threads unwind in opposite directions. Treat the two threads as one when threading the machine. At the needles, separate the threads and thread each needle. Before stitching, pull the threads to the back of the machine to ensure there isn’t any twisting of the threads. Double check that your machine is set at a straight stitch. A zigzag setting, for example, could cause the needles to swing beyond the presser foot opening. You know what could happen then! Now, stitch! The details are all in the set-up. The bobbin accommodates both threads. It’s rather magical! Use double needles to create an embellishment. To create a raised effect, slightly tighten the top tension. On the wrong side of the fabric, notice that the fabric tunnels due to the tighter thread tension. Watch The Absolute Easiest Way to Sew (Part One, Part Two, and Part Three) on Sewing With Nancy online. From last week’s post, the random winner of a Supersized 5-in-1 Sliding Gauge, compliments of Clover, is Helen. She said: I love the smaller gauge and know I will love the big brother for measuring grainlines, circles, and a straight edge. Dear Nancy, presently I am using 2.0 twin needle with my Brother LX27NT sewing machine with width 3 and upper thread tension 4. But I don’t know how much width & tension , I should set for 3.0 and 4.0 twin needles. Maximum tension is 9. Width 5 and length is 4. Please help me out with this. What kind of double needle should I use for knit fabrics? Can I use universal double needle? What size? This is my first time with double needles ever. Nirav, You can use a 3.0 or 4.0 Double needle, either the Universal or Stretch needle (if available) needle type. Use a 3.0 or 4.0 double needle for knits. For most knits, you are able to use Universal Double Needles. Or, choose a stretch, double needle. Thanks so much for this post about using double needles, Nancy. I will have to give the process a try soon, especially on hems on knits. When loosening the top tension isn’t enough to prevent tunneling, try using a strip of stabilizer or paper under the fabric. I use regular copy paper and it works perfectly. A bit of a hassle to remove it but worth the effort. When loosening the top tension doesn’t work, try placing a strip of stabilizer or paper under the fabric. I use regular copy paper and it works wonders. A bit of a pain to remove though. Maybe you can help as I have never seen an answer to my problem when using a double needle. I do home clothing alterations and my machine has an auto tension which I have never had to adjust in all the years of using this machine. I suspect my problem could be with the bobbin tension, but do not wish to adjust that very touchy tension for fear of screwing up the machine tension so badly I will not be able to get it back to its original factory setting. The problem I have is with the double needle which has approx. 1/4″ spacing. It is similar to that which is found on ready made clothing. When ever I use it the top side of the fabric tunnels up between the stitching. It looks terrible as the fabric is raised and I am unable to flatten it out even with a steam iron. Can you tell me what I am doing wrong? To prevent tunneling, you could try using a lighter weight paper, like tissue paper which is easier to remove than copy paper, or a wash-away stabilizer under, over, or sandwiched with your fabric, if adjusting the top tension doesn’t work. If you really think you may need to adjust the bobbin tension to flatten the double-needle stitching, and your machine has a bobbin case, you could try to purchase an additional bobbin case to make the tension adjustments. Then, you would have one “factory” bobbin case for regular sewing and one you can use for those times when you need to change the bobbin tension. Make sure you mark the cases so you don’t mix them up later. Many people find having the extra bobbin case for special sewing set-ups is helpful and it is reassuring to have the factory-set one unaltered and available to go back to afterwards. I need some advice in using my double needle that I have never seen answered. I have purchased two double needles with different widths. Sorry I do not know the millimeter sizes. The one size is the narrow size which is typical spacing used on most store bought tees and knits. I have absolutely no problems using that size, but also have a slightly wider needle which is about 1/4″ between stitches. This needle I want to use for the wider type stitching space you see on ready made knits also. When ever I try to use that needle the top side tunnels and the material does not lie flat between the stitches. It looks terrible. I have tried loosing the tension on top and it doesn’t seem to help at all. It just gives me very loose stitching. I suspect I might need to adjust the bobbin tension, but do not want to make that adjustment since it could really mess up my machine tension to where I may not be able to get it back to the tension as set by the factory. I do know that it is a touchy tension adjustment and only needs just a very slight adjustment. I never have any tension problems when it is set at automatic tension in all the years I have used this machine. I use it for my home clothing alteration business. Can you tell me what I am doing wrong so I am able to use this needle? Thank you Nancy, for the double needle tip. I never have been brave enough or had the time to try to figure out how to use this feature. I will use this feature now! You are awesome! This is my second post I have read the first was about invisible zippers. My question for the double needle post is why do we need to do this with (I hope spandex is included) with knits? For the invisible zipper post I would like to know if there are tricks to adding the zipper to spandex. I make ballroom dance dresses and sometimes the zipper will buckle, or create a large fold. Sandra, be careful not to stretch the spandex as you’re inserting the zipper, which you already know! The reason for using a double needle for knits is to build in stretch to the stitching. The bobbin thread accommodates both the needles, creating a zigzag pattern on the underside of the fabric which provides stretch. Sandra, Using a double needle for knit hems is ideal because the two threads on the top, along with a third thread in the bobbin, create stitching that will slightly “give” when worn. For invisible zippers on knits, simply stay-stitch the opening before inserting the zipper. Wondering if double needle could be used to embroider a design with fairly low density? I’m not looking to increase density, but, would like to use two colors with one overshadowing the other. I have B/L Gold. Millie, I haven’t used the double needles for embroidery, but I have used them when stitching decorative stitches. In theory, it should work! Give it a try. My recommendation would be to stitch at a slower speed since the bobbin thread must accommodate two threads. Let us know how it works! Thank you for another valuable sewing lesson. You are my go to person for the correct answers with precise instructions. Been using your information since I started sewing. Nancy, I’m so glad that you have been, and continue to be, a sewing icon. I have learned so many things from you over the years. I’ve watched your TV sessions which I used to tape during the day while I was at work and then I would watch them at night from my sewing room, where I could re-wind until I had the process right. The best for me was making the chest area larger when the other measurements were fine. I was a bit skeptical at first of marking, pivoting and marking again but it worked like magic. Thank you ! ! ! I haven’t ordered from you in a while but when I did, the products were received exactly as requested… Good business ethics. You are where you were meant to be. On behalf of all sewers, a very big Thank you. God bless. I just bought a double needle and then got cold feet. LOL. But after reading this post and in a short while I will watch your video, I know I will have the confidence to use the double needle and have a great time discovering what it can do. Thank you for sharing all of your experience with us! It definitely does help a whole lot every day! Have a fantastic creative day! I have learned so much from you. You have the MOST complete teaching simple style of anyone I have ever watched or read. Thank you for YOU. I record all of you tv shows and review you youtube regularly. You are my go to person. I enjoy sewing with double/twin needles. I learned about the thread spools unwinding in opposite directions from one of the Sewing with Nancy TV programs! Besides straight stitching, I use twin needles with two colors of thread with decorative stitches, after carefully checking the maximum width. I love using double needles. I have a problem with knits though. My hems always have a ridge between the two rows. Short of buying a cover stitch machine, what can I do to correct/prevent this? Melanie loosen the top tension, you’ll get rid of the ridge or the “tunneling” as it is sometimes called. Try it, it will work! I didn’t know about the thread on the spools unwinding in opposite directions. I was a bit hesitant at first in using them, but they work and make you feel good about adding another avenue to your show off sewing skills. I learned from you today why my double needling has a tunnel. I’ll reduce my upper tension. Always learning something from you! I’ve wanted to try a double needle, and now I don’t feel so intimidated by it. Thanks for making it seem like it’s totally do-able.